Nappy ever after Which Areas? Our nappy laundry service is available in parts of the London boroughs of Hackney, Islington, Tower Hamlets, Haringey and Camden. We use an electric freight bike for our nappy delivery service and concentrate our customer base over a restricted geographical area. This makes our service a thoroughly green alternative to single-use (misleadingly known as 'disposable') nappies. EC1, EC2, E2, E8, E9, N1, N4, N5, N7, N16, N19, NW1, NW3, NW5, WC1, WC2. If your home is very close to one of these areas, we might be able to include your street, so please ask. 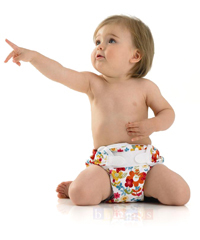 If you are further afield, try Number One for Nappies or the Go Real nappy finder database can help you find a local laundry or supplier of cotton nappies. We also supply children’s centres and nurseries – if you’d like your nursery to use our service, then please let us know and we will contact them.